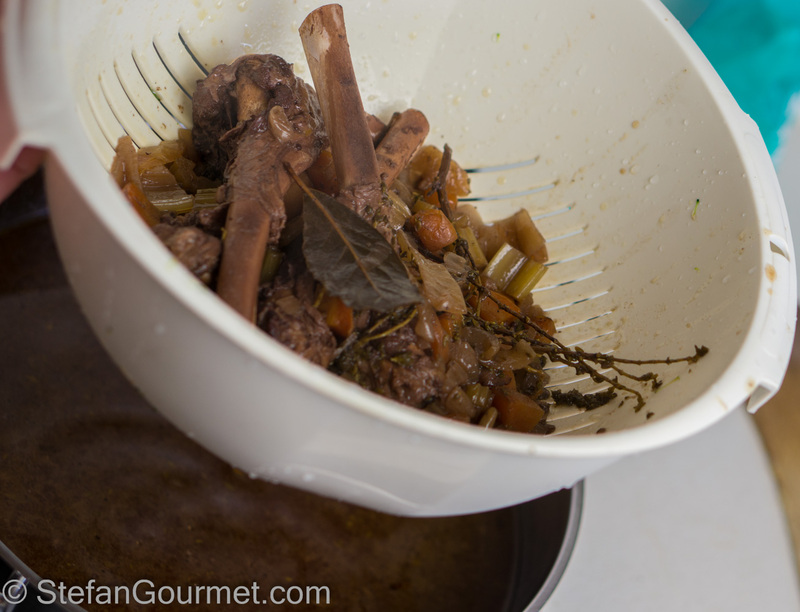 Lamb shank sous-vide is one of my favorite cuts of lamb. I tend to avoid serving meat or fish with bones when preparing dinner for company, unless I know they are comfortable with it. 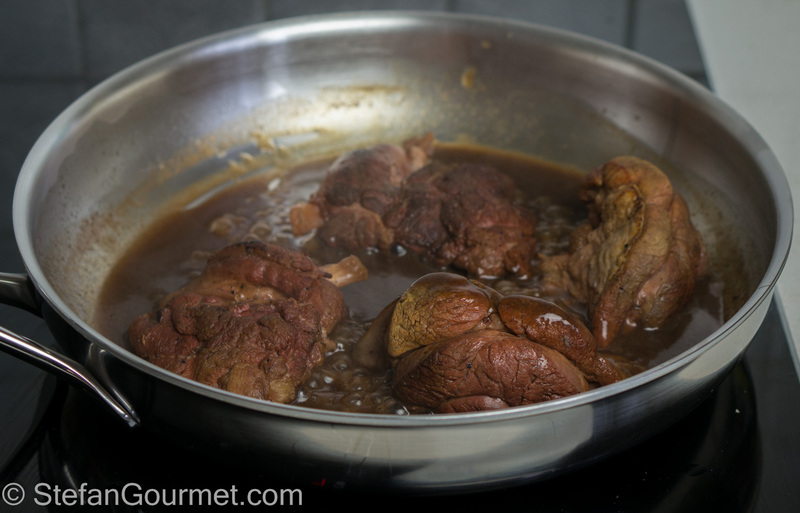 And so in order to serve lamb shank sous-vide, I decided to debone it first. 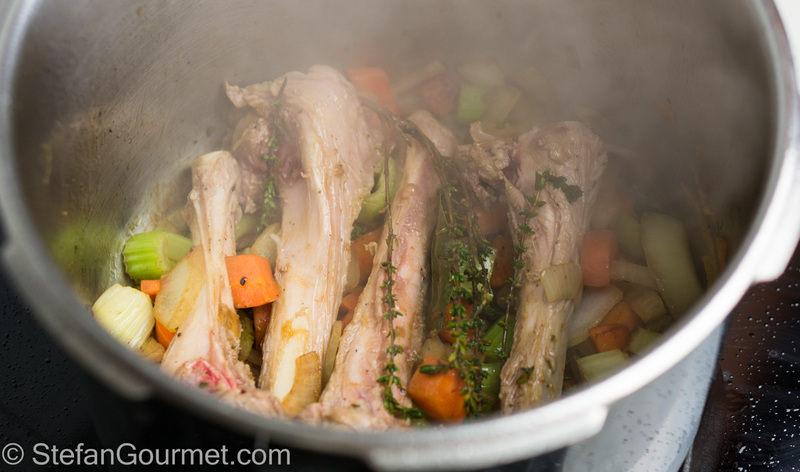 In the case of lamb shanks that is quite easy to do, and the advantage is that the bones can be used to make a stock to enhance the flavor and make a sauce. 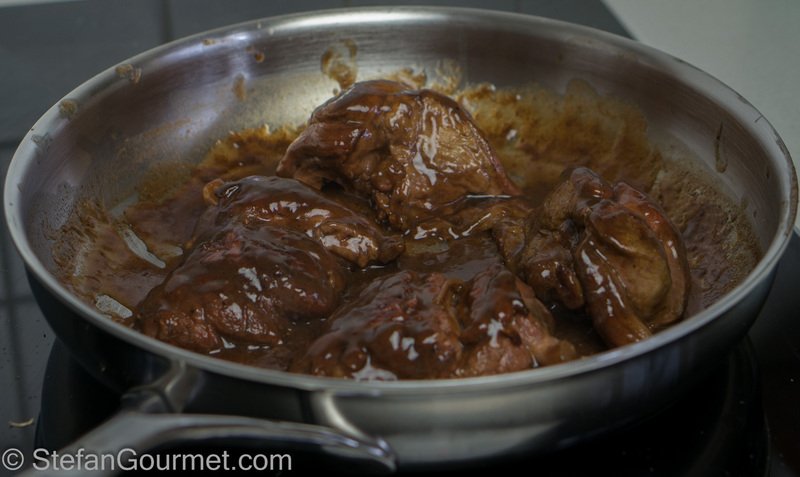 Another advantage is that you are not restricted to serving one lamb shank per person, but that you can easily serve more or less. 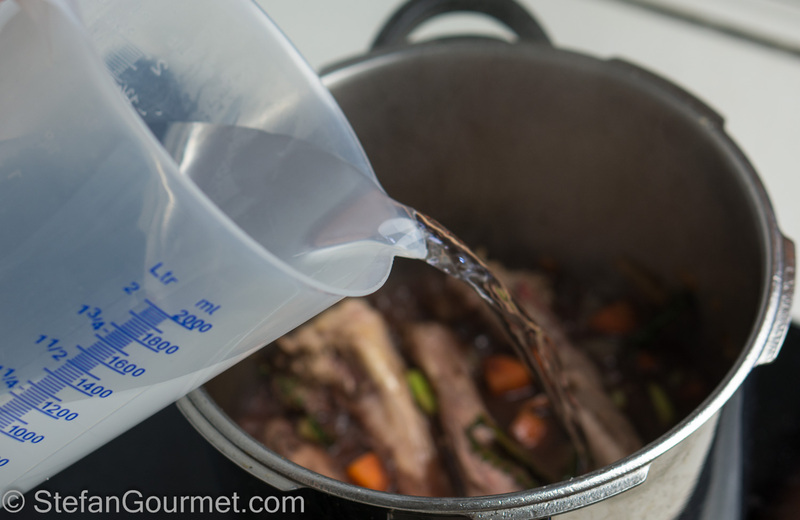 There is one tricky point about cooking lamb sous-vide and that is that ‘lamb’ is a loose term that can refer to a suckling lamb that is very young and tender (I’m not even considering unborn lamb, which is eaten in some cultures) or to a young sheep, and everything in between. This means that cooking time and/or temperature may need to be adjusted for best results. 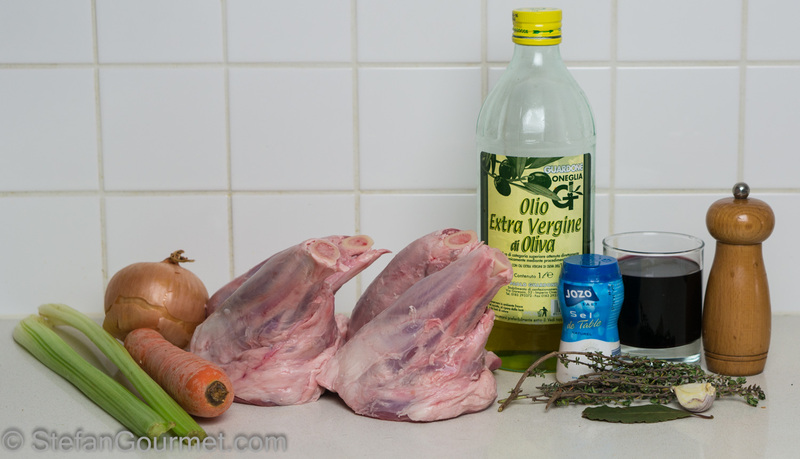 A general guideline for lamb shank that works for the local lamb here is 48 hours at 62ºC/144ºF, but for the suckling lamb (spring lamb) available right now only 24 hours is better. 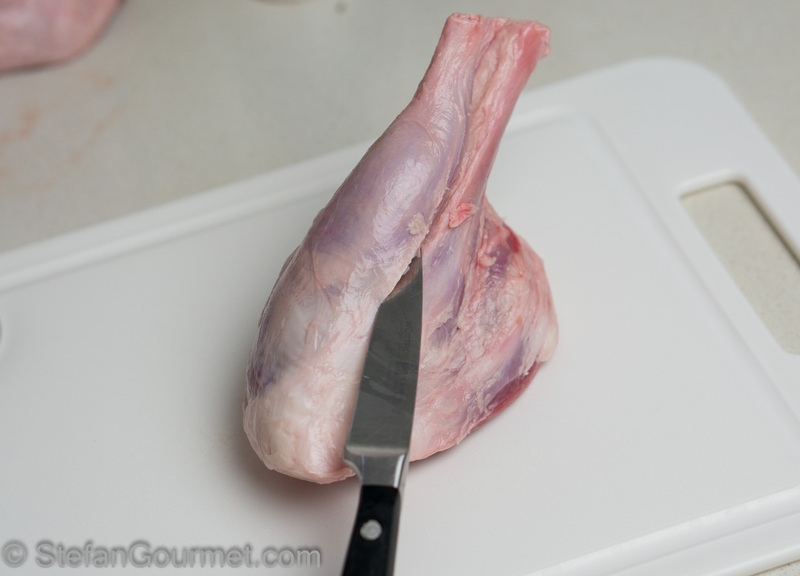 Use a small sharp (deboning) knife and start at the shin (where there is no meat, only skin on bone. Cut along the bone on all sides. Separate the bone, meat, and fat. Repeat until you have finished all of the lamb shanks. 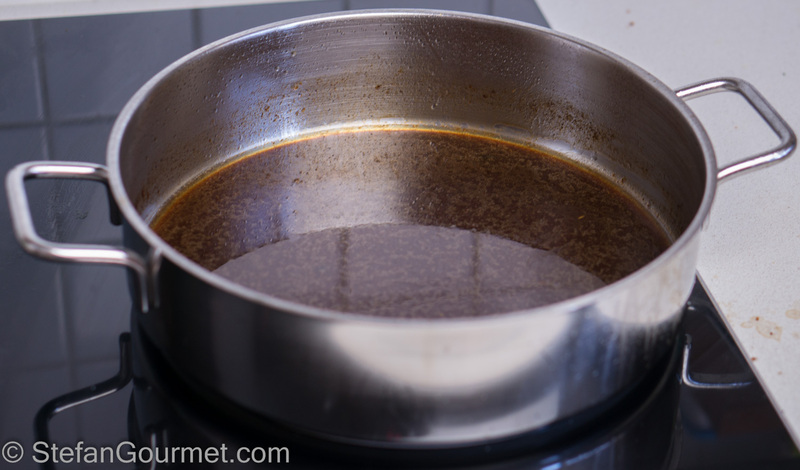 Heat the oil in a stock pot or pressure cooker and add the fat. 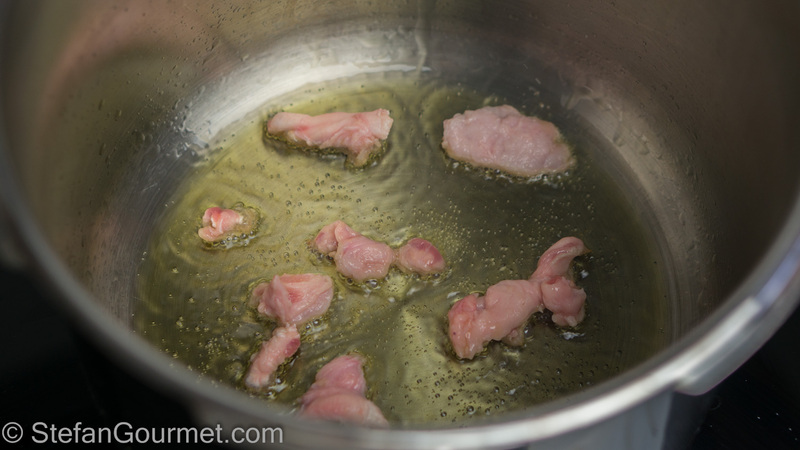 Cook until the fat has rendered from the pieces of fat and they are golden brown. 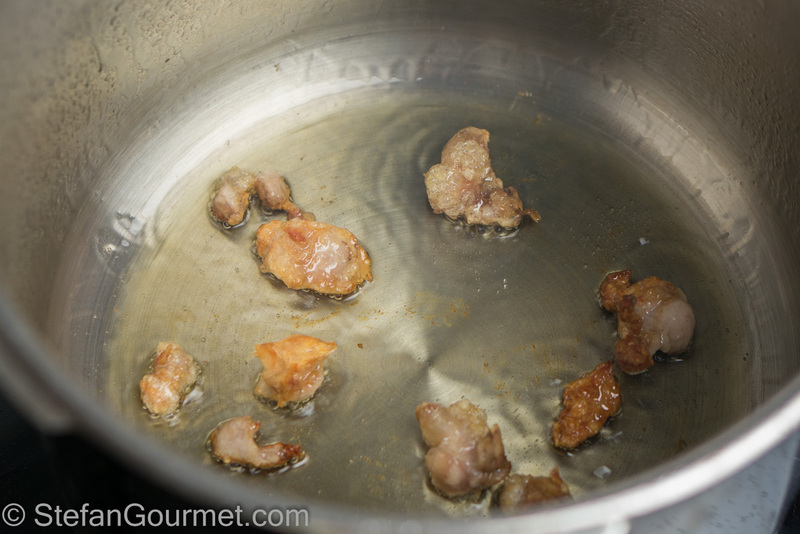 Discard the pieces of fat (or snack on them if you are into crackling). Season the meat on all sides with salt and freshly ground black pepper. 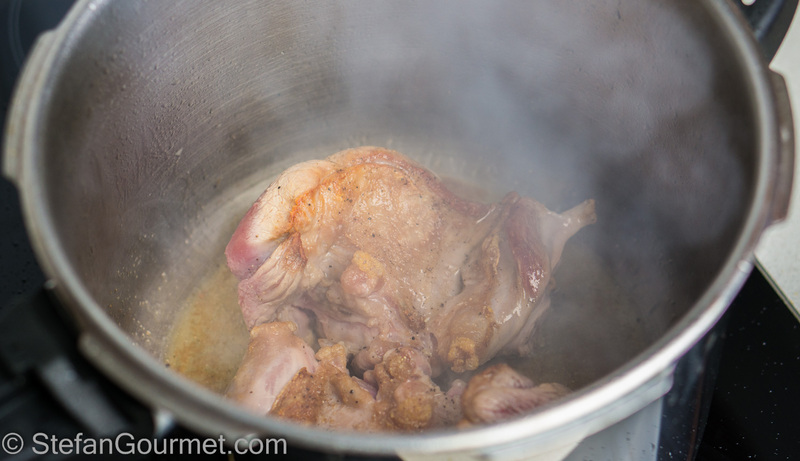 Brown the lamb in the fat on all sides over medium-high to high heat. Then take out the lamb and set aside on a plate to cool. 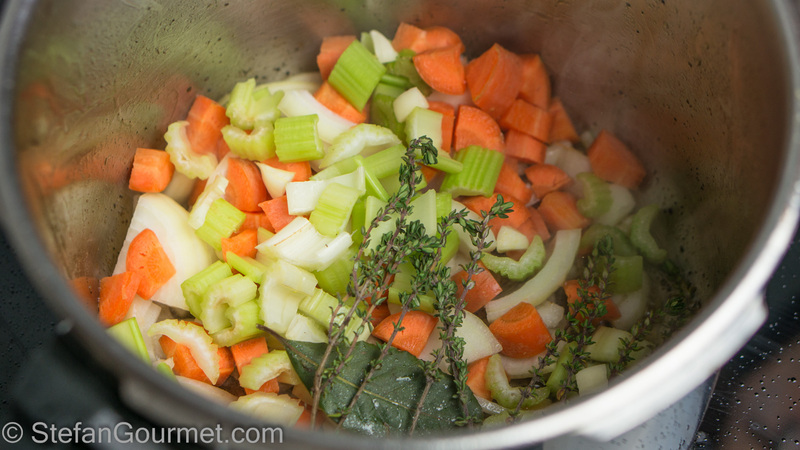 Add the onion, celery, carrot, bay leaf, thyme, and garlic to the stock pot or pressure cooker and sauté over medium high heat. After a couple of minutes, add the bones. Sauté until they have lost their raw color on all sides. 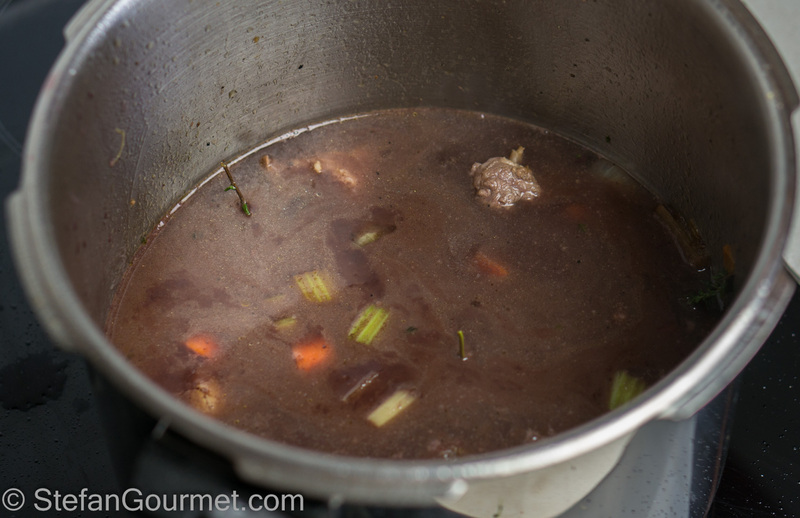 Add any juices that leaked out of the browned meat as well (we don’t want to discard any flavor!). 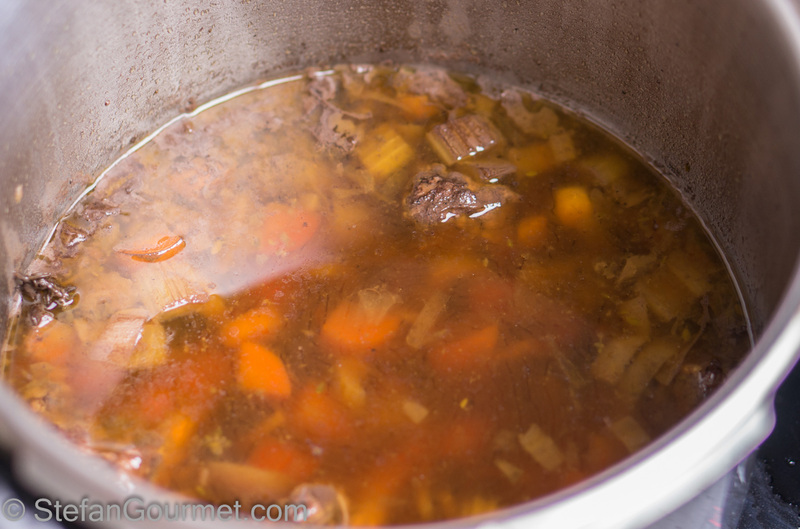 Pressure cook for 2 hours or simmer for 4 hours, while the meat is cooling off. 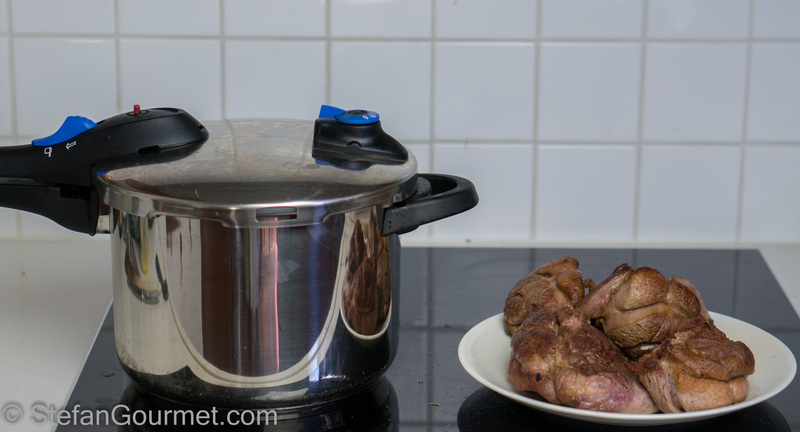 The lamb stock is ready after 2 hours of pressure cooking or 4 hours of simmering. 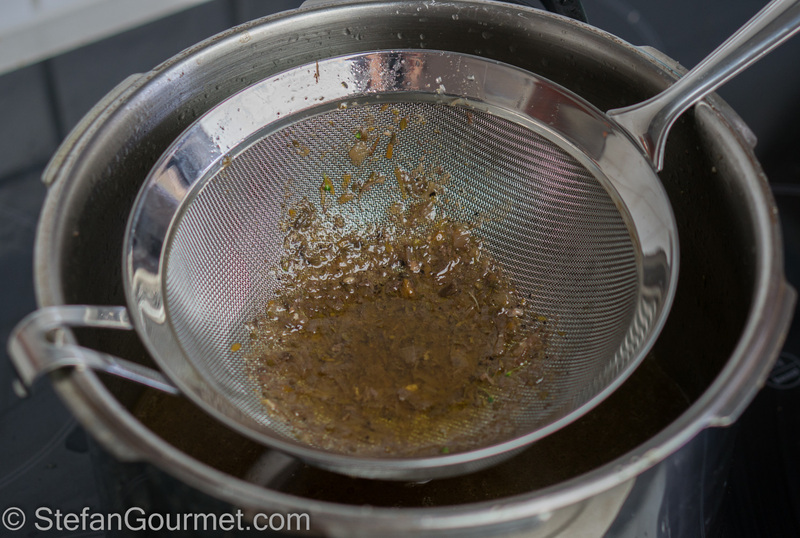 …and then again through a fine sieve. 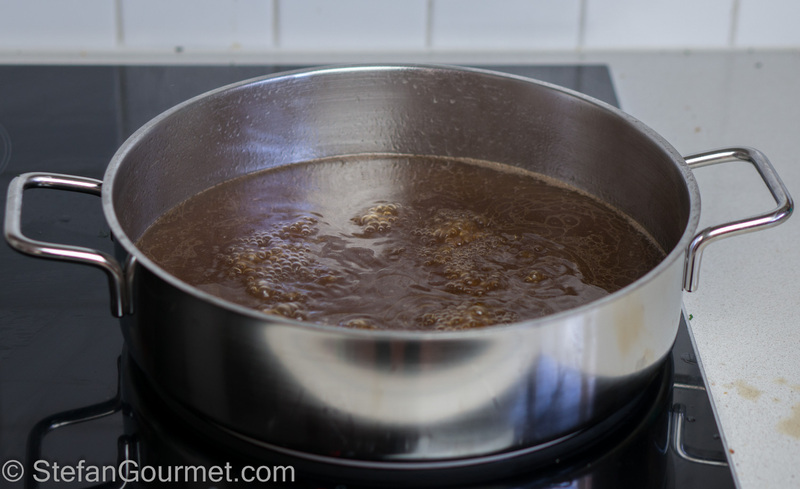 …and simmer until reduced to about 125 ml (1/2 cup). 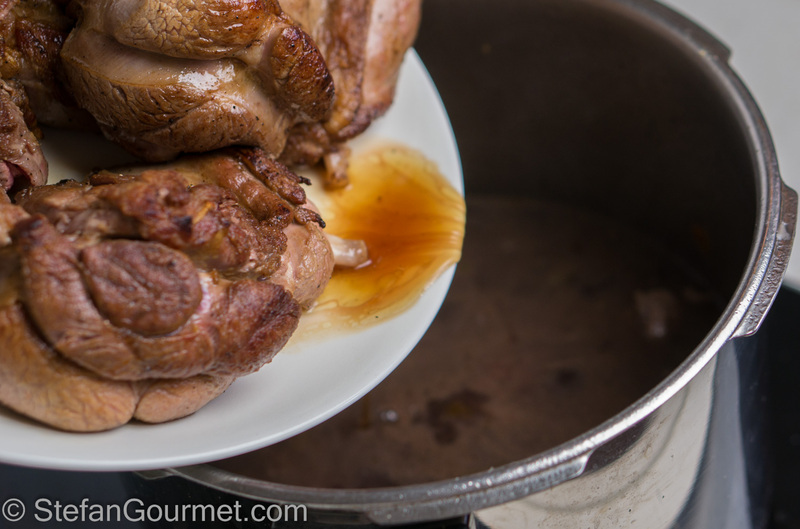 Allow to cool and remove the fat that will float on top. 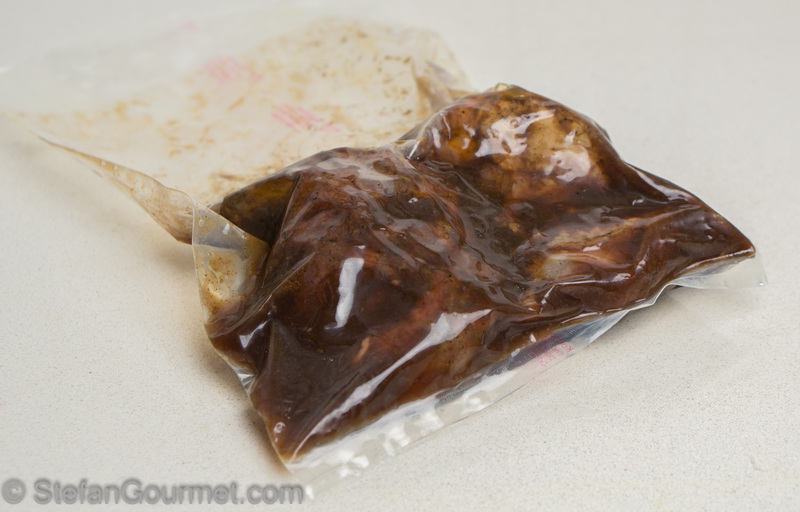 Vacuum seal the meat with the reduced stock. 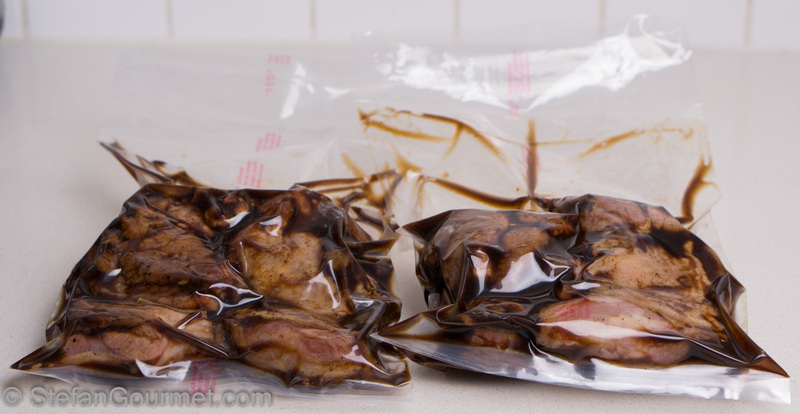 You can do this either with a chamber vacuum sealer (make sure meat and stock are room temperature or preferably refrigerator temperature, as otherwise the juices will boil at the low pressure), or in a ziplock bag using the water displacement method to seal it with as little air as possible. 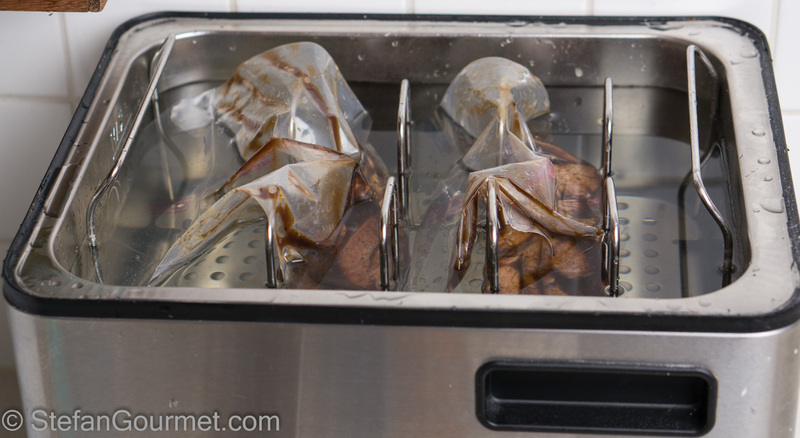 Cook sous-vide at 62ºC/144ºF for 24-48 hours, depending on the age of the lamb. 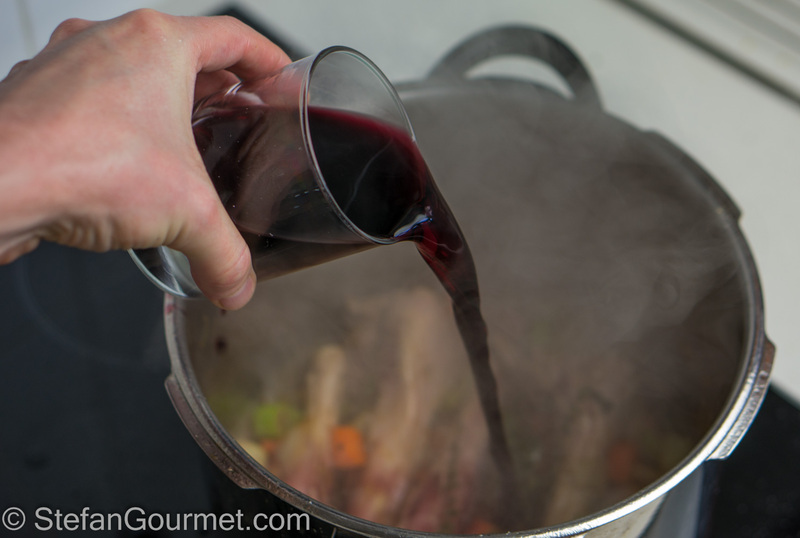 At the end of the cooking, quite a bit of juices will have been released by the lamb. It is a shame to discard them, as they are very flavorful. Strain the juices into a pan and bring to a boil. 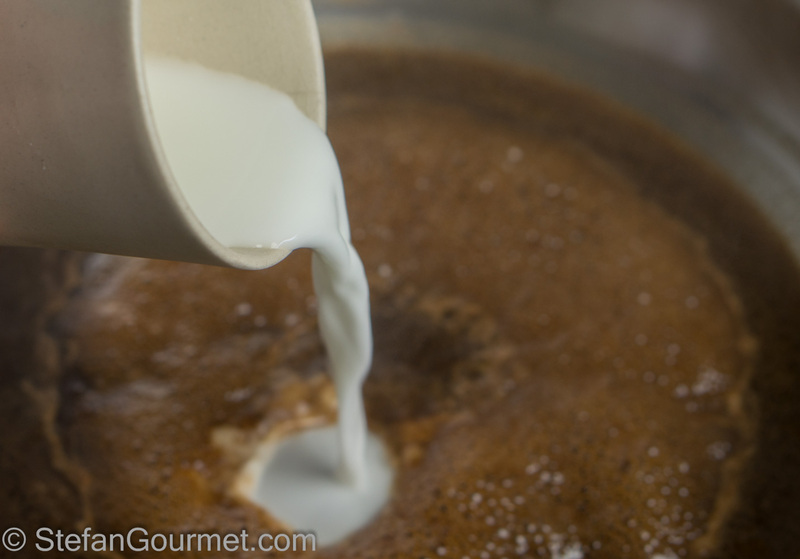 Mix a tablespoon of corn starch with two tablespoons of cold water. 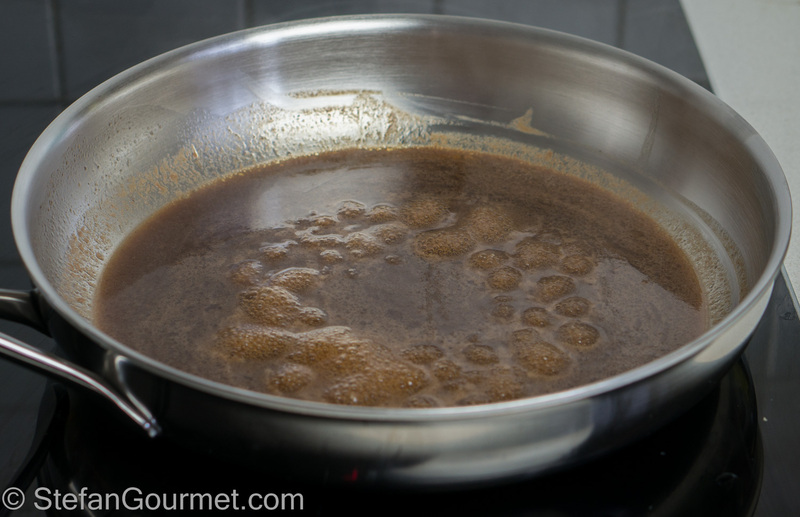 Pour this slurry into the pan with the juices. 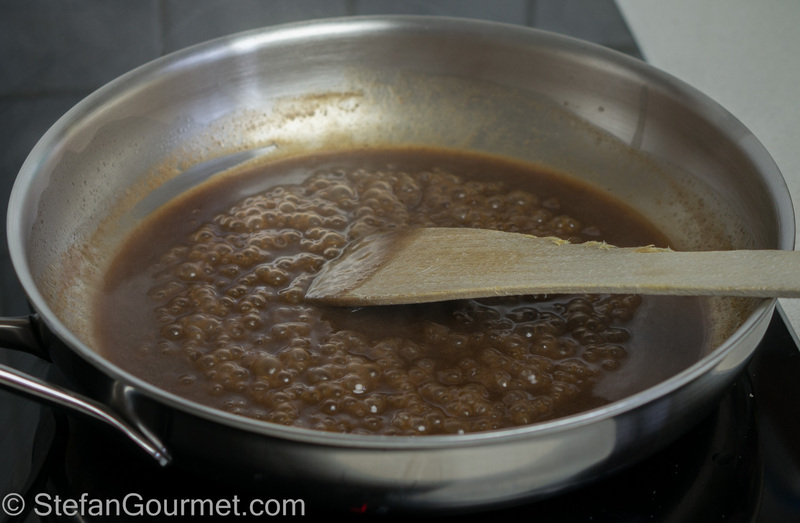 Cook, stirring, for a minute untilt he sauce binds. …and toss to cover with the sauce on all sides. 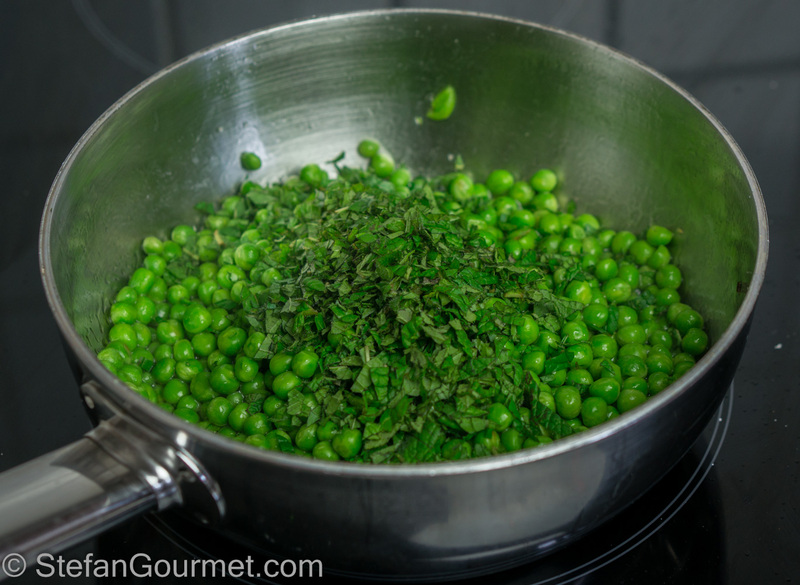 To make the peas, melt the butter in a saucepan and add the peas. Cook them until they are tender but still firm to the bite. 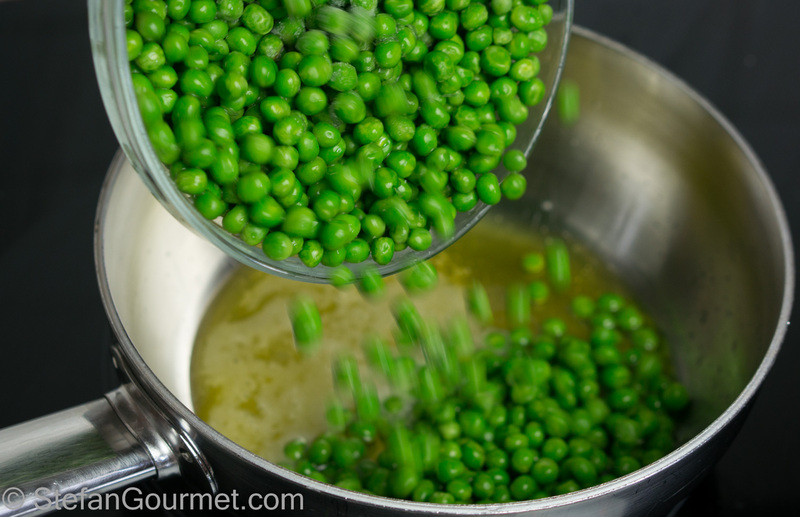 When using fresh peas rather than frozen, you may need to add a bit of water. When the peas are cooked to your liking, season with salt. 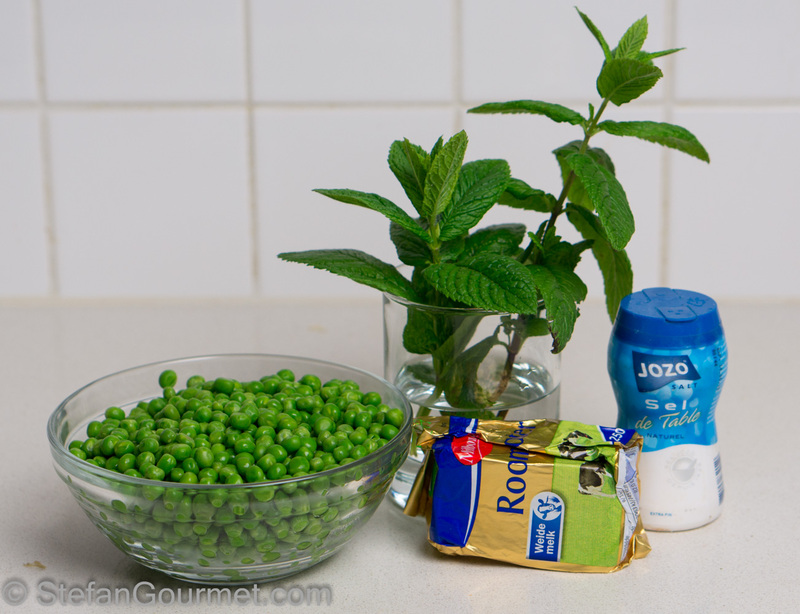 Add plenty of chopped mint, and stir to incorporate. 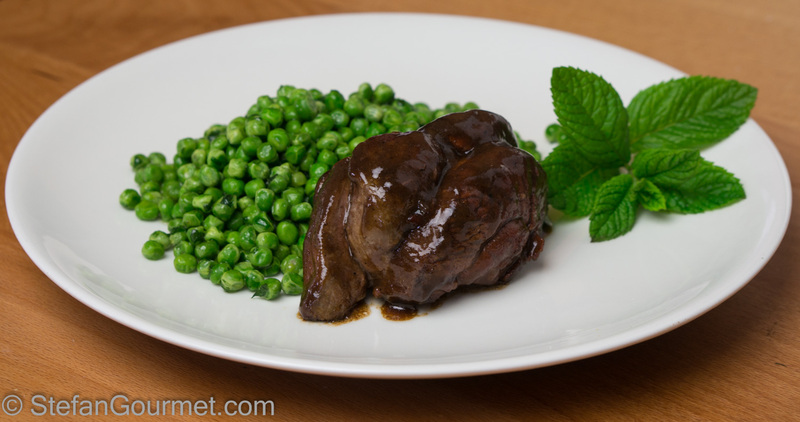 Serve the lamb with the sauce and the minted peas on preheated plates. This is great with a pinot noir, preferably a ripe one to go with the ripe flavors of the lamb shank. 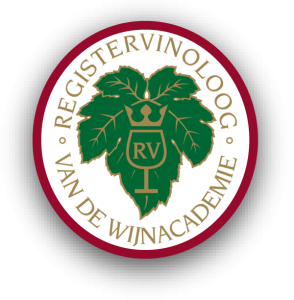 The ripeness can be either from the ripeness of the grapes, or because the wine has ripened in the bottle. A bit of oak (barriques) is fine, but not too much vanilla. We enjoyed it with a Spätburgunder Auslese from the Ahr valley, made with barriques. You probably all know lasagne alla bolognese, with bechamel and a bolognese meat sauce. 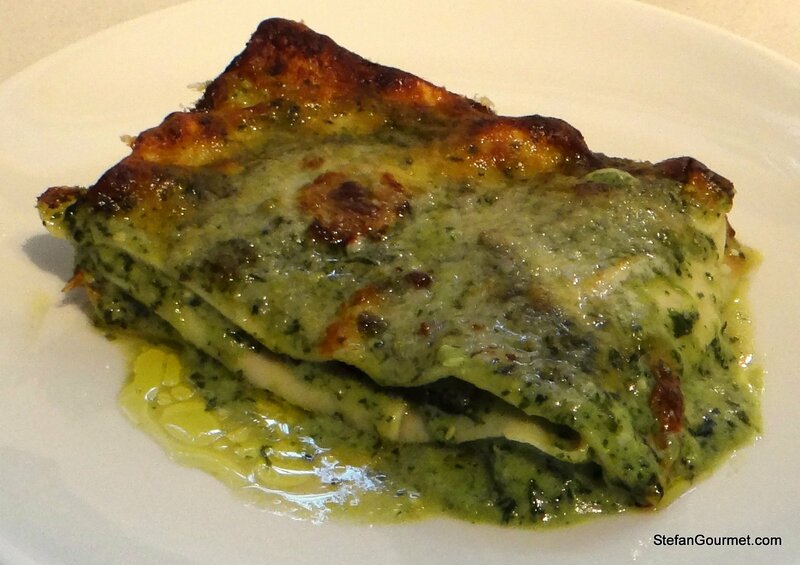 In Liguria a different version is prepared, with pesto, bechamel and grilled zucchini. This vegetarian Lasagne alla Genovese is delicious and absolutely worth the effort. La carne coi piselli mi ricorda tanto mia mamma! Anche se io non cucino l’agnello. Disgusted with myself now I have to admit having eaten unborn baked rack of lamb at Easter in Rome with the then King of Sweden at the next table having the same courtesy of my advice . . . oh it was incredible, but ‘thank God’ that would not happen again and now!! 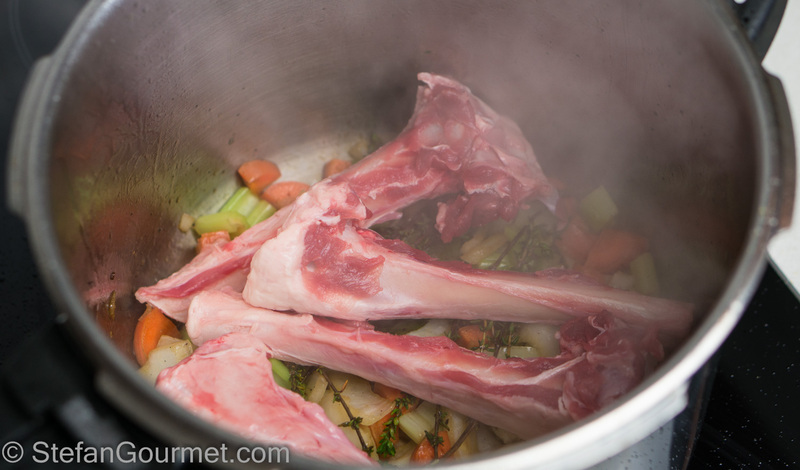 Love lamb shanks – yours look way nicer than what I can get: Connemara Irish ?? Hi Eha and ‘welcome back’ 🙂 Great story. I have never had the pleasure. There are those who favor suckling lamb because it is to tender and delicate, and those who favor a slightly older lamb (4 months or so) because it has a boulder flavor. I like both, and am curious about the unborn that must be even more tender and delicate. My lamb shanks are Dutch of course. It is a well kept secret (good for prices) that the lamb from around here is among the best of the world. They are grass-fed (in case of suckling lamb it’s the ewe that does the grass eating) and free range. We have some of the best grasslands, rich and slightly brackish. Only other lamb available here is from NZ or low quality stuff at halal butchers (not because it is halal but because it is from young sheep instead of proper lamb; I once tried a shank sous-vide and it wad tough and flavorless). OMG! I did forget to include Dutch/Belgian etc lamb on a recent ‘comparison’ on one of our fave blogs!! We have the numbers, you people would have the quality 🙂 ! We do lack the grass most of the time! I must have been in my early 20s when a couple of ‘unborn’ lamb dishes came my way both in Italy methinks . . . perhaps I still lacked the know-how but did not think them all that different. Am afraid that being somewhat of ‘greenie’ now and all for ‘sustainable growth’ I simply could not repeat that gastronomic exercise . . .
I’m not sure how much of our lamb is exported. I’ve heard about Spanish lamb that is supposed to be phenomenal and I may have had it once at a restaurant (Chez Victor) in Salamanca in 2004. Back then I wasn’t aware of this type of lamb, but I do remember it as the best lamb I’ve ever had. 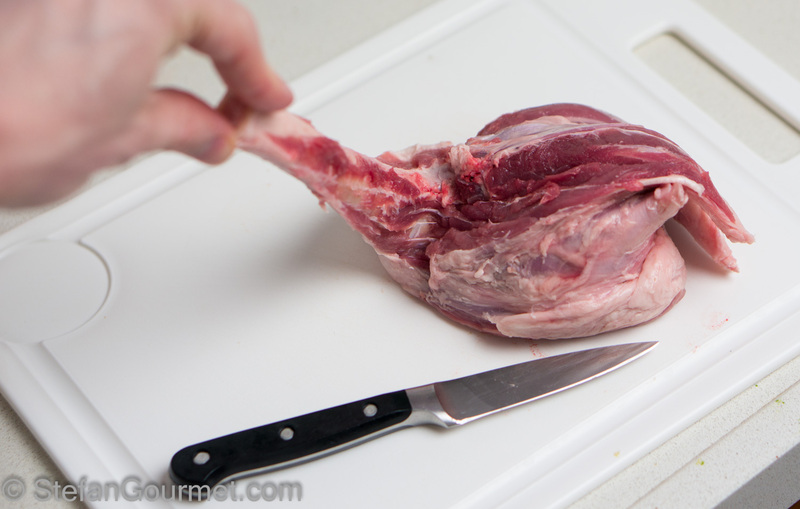 Deboning is a great technique for managing portion size. Thank you for the idea.